Contractors have dozens of different tasks to complete on a daily basis. One particular job that is not incredibly glamorous but is vitally important in site prep and general construction is soil compaction. This process helps set the foundation for whatever structure will be going on top of it. In simplest terms, the compaction process essentially increases the density of the dirt bed, which provides a more stable foundation on which to build. Before even deciding on a piece of equipment to help carry out the job, contractors can get ahead of the game by considering both soil type and moisture levels. The most common types of soil that a contractor would encounter are cohesive (clay) and granular (sand, gravel and silt). In terms of moisture, too much moisture can compromise the integrity of the foundation, and too little moisture can result in poor compaction, as moisture helps the soil granules adhere to one another. These factors, along with the general size of the area to be compacted, are important in determining what kind of compaction equipment to rent or purchase. Both plate compactors and rammers offer unique advantages and are crucial to achieving a solid foundation upon which to work. Rammers are ideal for any soil classified as cohesive (clay). A good rule of thumb is if the soil composition is more than 30 percent clay, it’s cohesive. The maximum movement of a vibrating body from its axis in one direction is called amplitude, and that’s what rammers rely on primarily to compact soil. This is important to consider when determining which compaction equipment will best fit the application. Rammers have higher amplitude than their plate compactor counterparts, which is one of the primary reasons why they do so well in cohesive soil. The repeated impact force essentially forces air and water up and out of the soil beneath. Rammers have lower vibration frequency when compared to plate compactors but can generally cover more ground in a shorter amount of time. In this category, there are varying ranges of blows per minute. 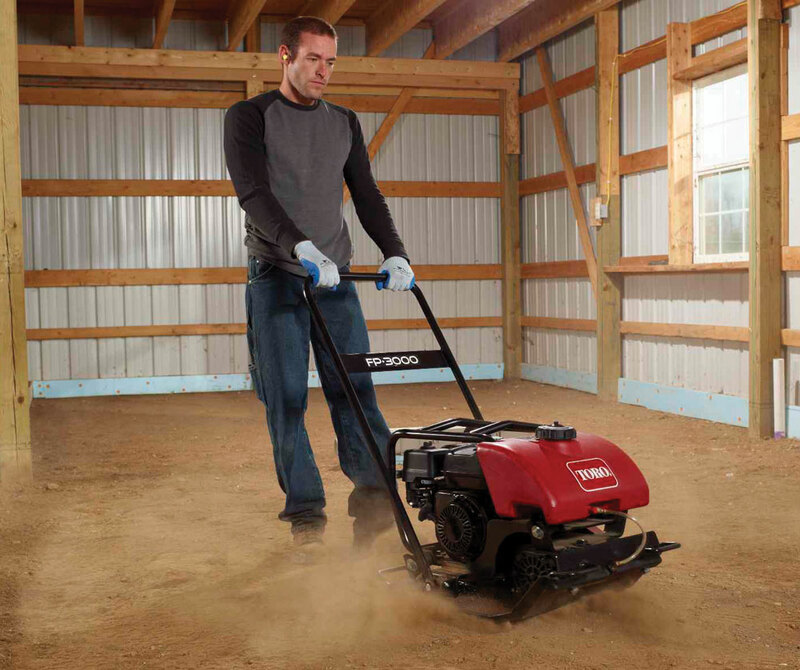 Toro rammers can provide anywhere from 650 to 750 blows per minute and can exert forces of up to 3,500 lbs. Rammers can be easily handled by one person and are easily transported to and around the jobsite. Additionally, rammers can typically fit into tight areas where a plate compactor or trench roller would be unable to reach. 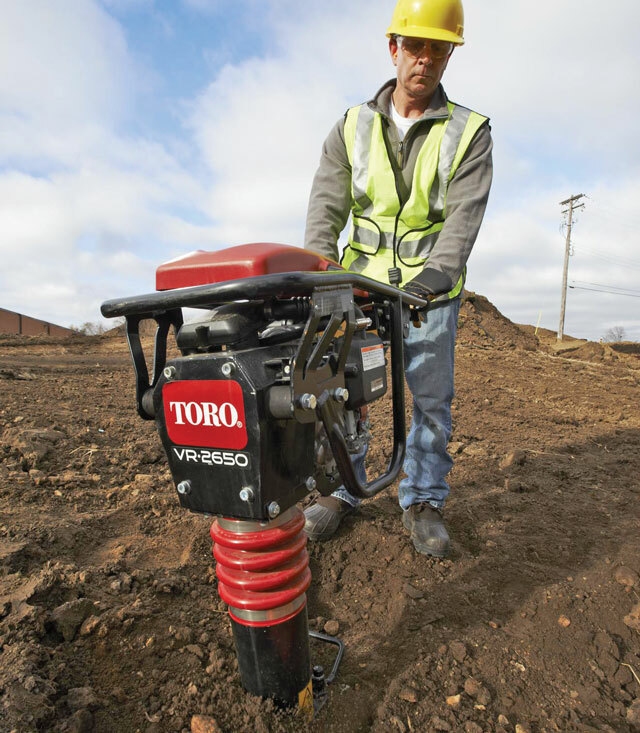 What plate compactors lack in ground speed, they make up for with vibration frequency levels. Plate compactors are available in forward-only and forward/reverse models and can reach vibration levels of 6,000 vibrations per minute. They’re typically a bit bigger and bulkier than rammers, but the increased weight of the machine and larger surface area contribute to a smoother overall compaction. These machines are ideal for granular soils, as the vibratory nature of the machine encourages particles to fall into a stable position beneath the soil’s surface, eliminating air pockets. Changing direction and even concentrating compaction in one area is simple with most forward/reversible plate compactor models. Again, it’s crucial for the contractor to first understand the terrain, soil composition and moisture levels before selecting a piece of equipment. Regardless of equipment selection, the operator should make sure to wear approved personal protective equipment (PPE) and take frequent breaks to avoid operator fatigue. Compaction is a lengthy and, at times, complicated process, but with the right equipment, even the most difficult jobs can be handled with relative ease. There’s an abundance of manufacturers that offer light compaction as part of their equipment lineup, including Toro and a host of others, so there’s no shortage in the amount of options available to the contractor. Each manufacturer offers different features and benefits of these handy machines, but they all accomplish generally the same thing — setting the foundation for construction. When it comes to rammers, this equipment very literally delivers (and takes) a beating on site, so it’s important to select a machine with extremely durable components, specifically the moving components. Some manufacturers, including Toro, offer a high-impact poly shoe with a steel-reinforced base plate to withstand the demands of the compaction job at hand. Heavy-duty rubber shock mounts can also help cushion vibration to the operator to reduce fatigue on site. Contractors may also want to consider a unit that has protective covering and side shields equipped on the rammer to add further protection to the engine and reduce downtime on site. For plate compactors, there are typically additional options available depending on the application and soil type. Similar to their rammer counterparts, plate compactors also have a tendency to take a beating out in the field, so investing in equipment with heavy-duty components engineered into the machine is a plus. Some plate compactors feature Kevlar belts and are mounted on an offset sheave to reduce belt stress and increase the longevity of the components, while heavy-duty dual stage shock mounts help isolate the engine components and operator from vibrations during use. Other options available on the market for these classes of equipment include electric start, which can be helpful starting during colder months, and see-through polyethylene fuel tanks for quick and easy fuel checks on site. Learn more at your local dealer. Sean O’Halloran is the marketing manager at The Toro Co.